Here again with another multi-week update, let’s get the season caught up. It looks like this season’s rankings had a really good first part of the season, but a rough stretch recently – quite a few victories were seen as upsets. Well, what can I say. Real life happens. I can’t promise the updates will be as regular this season, but here’s some information on the first part of this season. Well, once again the season has snuck up on me, but that’s okay since the first two weeks of the season always lead to fairly boring graphs. And with the start of the season comes my call for volunteers! I should be able to post the weekly graphs, but there’s definitely room for more contributors. What I can offer in terms of support is various output from the data to make your article-writing easier, and accounts on the wordpress system so you have free reign to publish. I can’t offer pay, but I don’t get paid either, this has always been a labor of geeky, irreverent love! If you’re interested in helping out, please contact me through my personal site at http://curtsiffert.com/feedback . Thanks! Hey all! This is Kenneth here, with the last rankings for the 2010 NFL Season. Hey, I know it’s been even a week later than TT, but you should enjoy the spacing! Who knows when we’ll have pro football again; we need to make it last as long as possible. In all seriousness, it was a pretty interesting season; I hope you all enjoyed it. The effect of one game sometimes makes a big difference in the graph, but not this time. Instead, the graph is mostly stable (but not entirely!). Thus, most of my commentary is going to be based on looking to the future and not on graph stuff. I’m sure that will be boring to some of you, but there’s not much to talk about. Anyway, let’s get to the rankings! You can find the graph for this week here. (Beat PIT) Well, the Packers got it done. They were able to beat the Steelers in a fairly sloppy game, my opinion. The win over the Steelers had only one effect–it formed a beatloop of GB=>PIT=>MIA=>GB. But the loss to Miami was already looped away by the Packer’s win over Chicago, so there was no gain for the Packers. But they’re still #1, so they can enjoy that. I know there’s a lot of talk about how the Packers are set to be a dynasty, since they’ve got so many injured starters returning, but I’m not sure I’m buying it. It seems like a fair amount of those guys were their worst starters, and I’m not certain the starters are going to upgrade the situation that much. I’m not saying they won’t be good–they will–but I won’t expect them to become incredibly better. (Bye) Philadelphia maintains the number 2 ranking. I hear a lot of people talk about how the Eagles HAVE to keep Kolb to back up Vick, but I think if you are committed to Vick, you should probably trade Kolb. It’s just a huge resource to not get any value out of. People think about the potential loss from Vick getting injured, but don’t count the gain you could get from a player you get for Kolb. If Vick is injured for 4 games over the season, you might lose some of them that you would win. But what if you had a stud left tackle, or a great cornerback or pass rusher? Wouldn’t that make you better in all your games, and help you in the games Vick misses as well? And if Vick gets lost for the season, is Kolb going to save you? (Lost to GB) It was a decent effort by the Steelers, but fell short. Unlike the Packers, this loss cost them something–a beatwin over the Dolphins. I think people are being too hard on Mendenhall; I think Roethlisberger made huge mistakes, too. That pick-6 was devastating. And before you say that he was forced into it by the defense, it’s not like Mendenhall wasn’t hit by two guys at the same time. But the real story to me was the lack of the Steelers’ pass rush–they just never seemed to get to Rodgers. I know he’s an elusive quarterback, but I expected him to be under more heat than he was. I wonder if Pittsburgh is going to start falling off soon; it seems like a lot of key players are getting old and wearing down. Polamalu hasn’t been himself, and Hines Ward seems ready to retire. I’d feel better about Ward leaving if they still had Santonio Holmes, but I’m not sure Mike Wallace can pick up the slack. (Bye) I wonder how much longer Tony Gonzalez can be an above average tight end (actually, I’m not sure he was this season). I think the Falcons have to hope he can, because they don’t seem to have many targets behind Roddy White. Unless Michael Jenkins steps up, I think that’s what the Falcons should go after this offseason…or maybe an impact player on defense. (Bye) So, the Patriots had the best regular season record, and have a lot of picks to go with that. You can bet they’ll get a lot of value out of it, too. Even with Randy Moss or someone like him, I think the offense is probably pretty good…investing more in the defense seems like a sound idea to me. (Bye) The Jets seem to have it all, especially if they keep Santonio Holmes. Honestly, the thing this team needs most is continued improvement from Mark Sanchez, and you can’t draft that. The Jets might be in the enviable position of just being able to draft the “Best Player Available”. (Bye) My thought is that the Ravens need better WRs. The problem is, they needed that last offseason too, and they went out and tried to fix it. And now they still need better production from that position. Normally, I don’t advocate drafting a WR when you need one right away because they’re almost never ready, but the Ravens might be in a good position to do it: they have a lot of veterans who, if they bounce back, can hold the fort while the rookie develops. (Bye) What do the Colts need? Somebody to teach Peyton Manning how to read financial statements, maybe? Actually, I think that was a really arrogant and stupid thing for the Panther’s owner to say. I mean, come on, he’s the owner of the Panthers–who cares what he thinks? Anyway, the Colts clearly need to figure out who is going to come back healthy and at the same level as before. If everyone bounces back, they could be ok. Although they still need to work on that offensive line. (Bye) My guess for the Giants is to improve the back seven. They’ve got so much in the defensive line, but they seem to pay less attention to the other guys–especially linebackers. I wonder about the offensive line, too–it’s my impression that they’ve slipped off from the high of a few years ago. (Bye) Well, in theory, I should at least know this team’s needs. I would say the draft should target three areas: OL, OL, and OL. Sure, there are some other positions this team could use help at (like DB) but the offensive line was awful and has some guys just holding on. They don’t have to draft guys to come in right away necessarily (although I’d like it if they did), but an infusion of talent is definitely necessary. (Bye) The Saints seemed to wither down the stretch, which is weird. Although I guess every single RB in the state of Louisiana breaking his leg will do that. The Saints probably should focus on defense. If they could get someone at safety, they could sit Roman Harper, which would probably be best for everyone involved. (Bye) Tampa! I’m going to really be interested in this team next season. I feel like they should get some more running mates for Josh Freeman. The kid is ready to take off. Mike Williams and Kellen Winslow are good, but I wonder about LeGarrette Blount. If he’s good, then I guess defense is the call. There’s probably going to be a need for a changing of the guard at CB, what with Ronde Barber getting up there. (Bye) Clearly, the need in Houston is for more and better defense. Unfortunately, they’re shifting to a 3-4, and their best player is a DE–and those guys aren’t always impact players in a 3-4. I know Wade Phillip’s D is a bit different, but still…I can’t help but worry that the Texans are going to neutralize Williams. Unless they put him at LB, which would be interesting. In any case, they clearly need better DBs. And some more LBs, if they’re going to run 4 out there. (Bye) I like what the Chiefs have on offense, so I’m going defense here too. The problem is, I don’t watch a ton of AFC games so I’m not sure what’s needed. In the few games I did see, I liked what their secondary was doing, so I think a better pash rush is in order. (Bye) I hate to say it, but I think what the Lions need to do is give up on Matthew Stafford. I just don’t think he’s going to be healthy, and his development has been stunted by all the injuries he’s taken. It’s probably not a good idea to take another high draft pick though. I might go with Shaun Hill again, actually. (Bye) Yes! Here we go! The one team that actually changed this week! As mentioned above, the Steelers losing to the Packers looped away their win over the Dolphins. Now, of course, the Steelers still have a beatpath to the Dolphins, but that still means a loss of a “hidden” beatpath. Losing that negative edge allows the Dolphins to go up one point in edgepower…which is just enough to break the tie they were in with the Cowboys. As for the Dolphins offseason…there’s a lot of talk about them going for a running back to replace Ricky Williams and/or Ronnie Brown. Sounds like a decent idea, but I don’t like drafting RBs high; I might spend more on the defense. It seems like they have some impact guys there; if they add another, they might really have something. (Bye) Too bad for the Cowboys. They suffer on the last week of the season. I’m not sure what to recommend for the Cowboys. Certainly, it seems like they have enough talent. But some offensive line help can always be useful. (Bye) The Vikings need is clear: QB. Unfortunately, I’m not sure that putting the pressure of trying to bring this team back to the NFC Championship game is something you’d want to put on the shoulders of Cam Newton or Ryan Gabbert or whomever. A veteran is probably the answer there. Meanwhile, the team didn’t tag Sydney Rice. It seems like a big risk to maybe lose him. Maybe a WR is in order. (Bye) You can at least divide the Texans’ offseason needs in half right away–defense only. The question is, which is more important–the secondary, or the front 7 and their new 3-4 look? This is a case where the possibility of no free agency–or at least, free agency after the draft–could really hurt the Texans. With so many holes to fill, you’d rather know what holes were left before you headed into the draft. All positions are available in the draft; not so in free agency. (Bye) I really thought the Browns were going to come out well when they drafted all of those WRs a few years ago (the Mohammed Massoquai class). But they don’t really seem to have come around. I guess some more playmakers would be in order, though I could see some benefit for the Browns in a defensive player, too. The Browns could be best off going for the best player available. (Bye) Seattle needs to figure out how to make Marshawn Lynch do that every game, is what they need. The bigger issue in my mind is quarterback (isn’t it always?). I guess I could see trying to get one more year out of Hasselbeck, but I’d sure like to have an idea where I was going to leap to once that platform vanishes. Is Charlie Whitehurst the answer, or do you need to get another QB of the future? (Bye) There’s word that Buffalo is cuckoo for Cam Newton, supposedly. I guess this fits my preferred method of getting a new prospect while you have a credible veteran to hold the fort, but I guess I’m just not a Newton believer. I’d probably look defense, if I were the Bills. (Bye) The word around here is WR. I don’t know if I agree–I thought their WRs were decent, before they all got hurt. I mean, not great, but not so dire that you had to do whatever you could to fix it. I’d rather see the team add more beef to the defense–another good pass rusher could really spice things up. But if a good WR prospect is available in the draft, some more talent there wouldn’t hurt. (Bye) We’ve all heard it several times now. This Chargers team was very good on offense, very good on defense, and yet somehow still was only mediocre at best. I feel like they could use a posession WR–even if you get Vincent Jackson back for a whole season, I think the offense could benefit from some consistency added to their big-lay ability. Although, maybe it would help if one of their RBs stepped up. (Bye) Word is the Redskins are QB crazy. How weird that they’re going after it again, only a year after trading for McNabb. Not that they’re wrong to do so. I still like McNabb, but I think it’s obvious he’s not going to make it work in Washington. A rookie is probably a bad idea, though. I can’t imagine any rookie being able to handle that pressure cooker. I might like to see some other offensive talent make its way to the nation’s capital though. (Bye) The Panthers need a lot of help. It sounds like they’re going to go defense with the top pick, which makes sense. I don’t know that they’re going to get any better on offense any time soon (their QBs are just not ready), and their new coach is a defensive guy. Maybe if they focus on that side of the ball they approach respectability relatively quickly. (Bye) Here I go again; I’m going to recommend better QB play for a team. The problem is, there just aren’t that many QBs to go around. Somebody’s bound to get stuck with awful play at that position. Maybe that’s why Harbaugh seems to be making nice with Alex Smith. Better the mediocre player you know than the one you don’t. (Bye) Well, this is just too easy. But the Cardinals really need to do something. I can’t imagine that Larry Fitzgerald is going to tolerate this much longer, and if he leaves, the vaunted Arizona offense is going to be a distant memory. Just getting someone who is only okay would be huge (Kyle Orton, maybe?). Draft-wise, I’d suggest defense; I don’t think there’s any real way to improve the offense outside of a better QB. They could get some good use from an impact defender, though. (Bye) I feel weird suggesting something for the team of the man who runs this site. Also, I’m not sure what to suggest. I think the defense will be much better when they get back Elvis Dumervil (he is coming back, right?). But I don’t know how much better you can make the offense. If you’re going to go with Tebow, then I guess that’s just something you have to do. Maybe another WR is in order–even if Brandon Lloyd could have that year again, you could still use more targets to help out. Hello everyone! Took a breather for a few days after the Super Bowl, but here is the year-end graph. We correctly picked the Super Bowl winner this season, but it was a close one. Before last week, I had actually incorrectly entered Pittsburgh’s Conference Championship win as being over the Giants instead of the Jets, and so for most of the week the system was telling me that Pittsburgh would be favored over Green Bay. Our good friend Kenneth caught it at the last minute, though, so all was well. It was a great year, despite the Broncos falling to last place. 🙂 Thanks again to all of the commenters for making this site fun, Moose for continuing to keep track of the other graphs, sports, and counting variants, Nick for helping to give the site a much-needed facelift, and of course Kenneth for doing such a phenomenal job with all the rankings and commentary this year. I’m sure we’ll be back next season (if there is one), but in the meantime I’ll toy with some other ideas of posting content. If any of you would like to assist in posting commentary about other sports, let me know, as I’d be happy to generate graphs and rankings and whatever else folks might be interested in. So without further ado, the final 2010 Beatpath Graph! Spoiler: it’s identical to the graph in the conference round, although I believe that an “invisible” arrow somewhere might have been removed. Hopefully Kenneth will be able to clarify on that. Hey folks! Kenneth here with the rankings going into the Super Bowl! I know you’re all excited to hear who’s ranked where going into the big game, so let’s get to it! But first…for the ease of glory/ridicule, let’s put the official pick right up here. And believe me–it’s a close one. Neither the Packers nor the Steelers have a beatloss, which means that neither of them have a beatpath to each other. And that means we have to go to the rankings. The Steelers are ranked very high at #3. But the Packers, just like last week, are ranked #1. That’s pretty close, and if it was a home game for the Steelers you might go that way. In fact, you could still see it happening. But the official Beatpaths.com pick is the Packers. (Beat CHI) Yes, yes. The Packers are back on top for a second straight week. Their 3rd victory against the Bears also helped by creating a 3 team loop with Miami. That loss had already been looped away, but in 3 four team loops involving their wins over Buffalo, Dallas, and Philadelphia (their first one). So, the win over the Bears gave them back some wins. It’s not a ton, but every bit helps. (Bye) The Eagles spend a second week in the number 2 spot. As mentioned, one of their loops got broken by MIA=>GB going out at the 3 team level–a four team loop of DET=>MIA=>GB =>PHI=>DET. While that doubled up the Eagles under the pack, it also gave them back their win over Detroit…which is nice, I guess. (Beat NYJ) Meanwhile, the Steelers’ win over the Jets does some giving-backing of their own. It created a season split with the Jets, which broke up a three team loop that had existed with Baltimore. That gave Pittsburgh back a win over Baltimore, although they already had a beatpath through Atlanta, so no huge gain for them. (Bye) No change for the Falcons, who are staring up at the two Super Bowl contenders. The bad news for Atlanta fans is that recent teams that win the NFC South have a bad habit of coughing it up the next season. (Bye) I’m just starting to get into mock drafts again, which is reminding me of the obscene fact that the Patriots have 3 picks out of the first 33 this year. Way to go, Raiders and Panthers! (Lost to PIT) Well, the Jets gave it their all, but it was not to be this week. The immediate question that comes to mind is whether they’re going to try to ride Tomlinson again. Can you get another year out of him? (Bye) As mentioned, the Ravens have a three team loop busted up that causes them to have a direct beatloss to the Steelers again. And they don’t get a win over the Jets back because there is still a three team loop between those two and the Patriots. (Bye) Am I the only person who is wondering what happened to Reggie Wayne this season? It seems like he was never making huge impacts. Very unlike him. (Bye) A typo originally had the Giants losing to the Steelers last week instead of the Jets. That’s for the best–being under the Steelers would have added more to the Giant’s pile. Not enough to matter, but some. (Lost to GB) Ah, how the mighty have fallen. Not this week, but overall. This loss formed a three team loop with Miami, thus costing the Bears their win over the Dolphins. I just want to say that this whole Jay Cutler nonsense is completely stupid. So what if he’s not super-rah-rah like you want him to be. It’s not like there are tons of great QBs out there to just go grab. If you have a good quarterback, you need to work with him. And while Jay Cutler might not be top 5 material, he is a good QB. (Bye) The Raiders at least did the league the favor of not giving the Patriots a top-5 pick by having a decent enough season. Actually, this is a pretty decent argument against trading players for picks–if you trade a good enough player, the team will do better and thus the pick you get will be worth less. (Bye) So apparently there’s movement on an NFL stadium in LA. I only mention this because the Jaguars seem like the best team to move there. The way I hear it, nobody shows up for games in that city. (Bye) Kansas City rounds up the top half of the rankings. That might seem disappointing for a team that had a good season, but I think you have to look at their season as a stepping stone. They’re not a finished product…yet. (Bye) It seems like there was big changes for Detroit. After all, the 3 four team loops that got broken up for Green Bay also got broken up for Detroit (they all had the path DET=>MIA=>GB). But there are still four team loops to take care of the Lions’ losses to Buffalo and Dallas, so it’s only a loss to the Eagles that they gain. (Bye) One real change this week is that Dallas got put under Green Bay. Thus, the Cowboys are directly under 3 teams with no beatlosses, instead of 2. (Bye) Have I questioned Sparano’s job security yet? For as long as that regime has been there, they don’t appear to be any closer to solving the QB situation. Unless there’s more to Henne than what I saw this season (which wasn’t that much, really; I’m an NFC guy). (Bye) Here’s my dream scenario: the Vikings draft a 1st round QB, and then Brett Favre announced he’s coming back a week later. Of course, knowing my luck that would probably somehow cause labor negotiations to fail and we’d all have no football (don’t ask me how, I just don’t trust Favre). So maybe I should just hope for some calm this offseason. (Bye) So…Jeff Fisher is out as well. Have to say I didn’t see that coming. I haven’t quite got a hold of the situation–did he leave on his own or was he forced out? His press conference seemed to indicate he left on his own, but that seems off to me. If he was forced out, nice of the Titans to wait until all the head coaching jobs were filled to do it. (Bye) I gotta say, I think Colt McCoy could be the guy. And they have Joe Thomas, too. Now all they need is another player on offense to make a real Triplets and they’d really be cooking (no, Josh Cribbs does not count). (Bye) I didn’t pay close attention to this team. What happened to Golden Tate? Last I heard he was stealing doughnuts–which made me smile so much I instantly liked him. Is he just taking the normal slow WR learning curve path to the NFL? (Bye) Buffalo loses a four team loop that was looping away their loss to the Packers. Shockingly, this doesn’t change much. They were under the Packers already, of course. (Bye) If I were the Rams, I think I’d go defense in the offseason. I think you can ride Jackson another year at RB, and if the WRs are healthy they’re not awful. Meanwhile, there’s a good base on the defense but you could use more players. (Bye) Can you draft special teams players in the first round? Not kickers or returners, just blockers and gunners and what not. Because honestly, looking at the stats from last year, it seems like it might be a good idea. (Bye) So far Mike Shanahan has yet to wise up and bolt out of town. (Bye) I was about to make a joke about how Cincinnati fans couldn’t even look forward to baseball season, but I forgot that the Reds were actually good last year. You go, Ohio. (Bye) Important question for the Panthers: is Steve Smith done? (Bye) This is really one of the teams I’m interested in for next season. This team could go lots of different ways, and I want to see how it shakes out. (Bye) I feel like the Cardinals are one Larry Fitzgerald “get me out of here” trade demands from collapsing completely. Am I the only one who is sensing that coming? (Bye) Once again, the Broncos are in last. They do have the advantage of playing in the AFC West, which should give them the opportunity to compete soon. Update: Image is corrected since I had accidentally recorded PIT->NYG instead of PIT->NYJ. The graph and upcoming rankings are slightly different. Not as closely ranked, but still very close. I just realized that I’m still saying 2010 for these posts. Still, I think it makes it clearer, y’know? Hey gang, Kenneth here again, and with another post with predictions for this weekend’s games. It’s a shorter set, but it’s also less confident. See, as our Dear Leader said earlier this week, none of the remaining teams have any beatlosses. That means that as far as the system is concerned, not only could any one of them be better or worse than any other, any one of them could be the best team in the league. So it’s a real free-for-all this week. Still, predictions must be made, and so we go on! New York Jets versus Pittsburgh Steelers: Now here’s a good game. The Steelers are ranked #3 in the rankings, while the Jets are ranked #6. That’s pretty close. They also have the same number of teams not below them–12, meaning that the lowest possible ranking the system would give either is 13. However, the Steelers have more edges beneath them, so they have a higher edgepower and thus are ranked higher. If the Jets were playing at home you might be able to make a case for them being the pick, but they’re not. They’re at the Steeler’s house. That means that the pick here is the Steelers. Green Bay Packers versus Chicago Bears: Here we go. I feel like I finally know what this season’s Bud Light commercials have been trying to tell me. Up until now, I thought it was “don’t drink Bud Light”. But now I understand those words…Here We Go. Outside of statistics and formulas, this matchup is one for the ages. It’s got history, rivalry, and just plain nastiness. But this is me speaking as a Bears fan. As a member of the Beatpaths team, I can say that the Packers’ win over the Falcons put them in a place they haven’t been in these rankings for some time (if ever): 1st place. Meanwhile, the Bears sunk down to 10th. I don’t know how much homefield advantage should be worth, but it’s probably not that much. Even though it hurts to say it, the pick is the Packers. So that’s two rankings-only picks for this weekend. We normally consider those picks to be over weaker quality than straight beatpath picks, and it’s true that our rankings-only picks were 0-2 last week. Of course, our beatpath picks were only 1-1. Hey, any given Sunday, right? Enjoy the games! Hey there folks! Kenneth here with more rankings! You know that I’m incredibly please with the way things turned out this past weekend. My Bears made it to the NFC Championship, and they get to host it thanks to the Pack! Which means we’ll have an epic rubber game in the team I love to hate. Plus, the annoying Patriots lost, and Pittsburgh-Baltimore was a good game! All in all, I really enjoyed the weekend. But enough chit-chat–let’s get to the rankings! (Beat ATL) Surprise! You didn’t expect to see these guys here, did you? But here they are, on top, and at the right time, too. So what happened? Two things. First off, the Packers beat the Falcons, which earned them a season split and broke up an existing three team loop of GB=>PHI=>ATL=>GB, so the Packers regained a beatwin over the Eagles. Also, the Jets beat the Patriots. 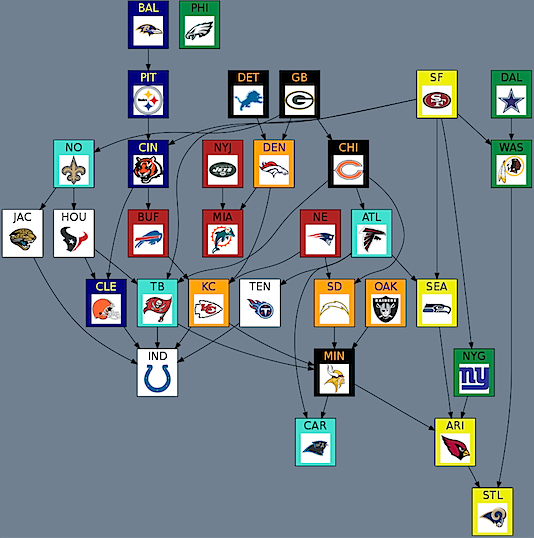 That formed a three team loop with the Packers of GB =>NYJ=>NE =>GB, which removed GB=>NYJ at the three team level. Which meant it was out at the four team level, and thus 3 four team loops got broken up–all of which depended on MIA=>GB. But there’s still a few other four team loops holding that at bay, and with the new three team loop the Packers get rid of their last beatloss (to the Patriots). That leaves them without any beatlosses, and a lot of support, so they shot up the charts. (Bye) It helps the Packers that the Eagles look so good, too. The Eagles regained a beatpath over the Falcons, and that nearly doubled their support. Well worth the price of falling back under the Packers. (Beat BAL) Pittsburgh got on that Falcons horse, too. Their win over Baltimore created a three team loop of PIT=>BAL=>NYJ=>PIT, which looped away BAL=>NYJ at the three team level and thus broke up a four team loop of PIT=>ATL=>BAL=>NYJ=>PIT, so Pittsburgh got back its win over Atlanta. The removal of NYJ=>PIT at the three team level also broke up the four team loop of PIT=>MIA=>GB =>NYJ=>PIT, giving Pittsburgh back its beatwin over Miami. But this was a smaller bonus to the Steelers (although still useful). (Lost to GB) I said it before, I never trusted the Falcons this season. And now, they’ve lost…but they go up the rankings? How did that happen? Well, you remember the loop that got broken up to put PIT=>ATL back in the graph? It also put ATL=>BAL back in the graph, too. And that benefited Atlanta more than being under 3 teams did. (Lost to NYJ) I tried to warn people last week. I told you all the Jets were the most dangerous team for the Patriots. Anyway, the loss to the Jets formed 3 three team loops that cost the Patriots beatwins over the Ravens Bears, AND Packers. A lot of tough breaks, but it didn’t drop them far. (Beat NE) No respect! The Jets beat the Pats and are still ranked below them! Fell down a few pegs, even! Well, the truth of the matter is that this win didn’t do much for the Jets. It did loop away the only two teams that were above them last week (Chicaco and New England), which is nice. But it didn’t add much support. The fact that NYJ=>NE =>GB=>NYJ loops away GB=>NYJ at the three team level does break up some four team loops of NYJ=>CLE=>MIA=>GB=>NYJ and NYJ=>DET=>MIA=>GB=>NYJ, which gives the Jets back wins…over the Browns and Lions. Like I said, not much support–and not enough to hang with the other teams that zoomed ahead with beatpaths to the Falcons. Keep trying, Gang Green. (Lost to PIT) As discussed, the Ravens fall below the Falcons. The loss to the Steelers also formed a three team loop with the Saints, costing the Ravens that win. If you had told me before that game that the Ravens would have a 14 point lead at halftime, I would have said “Game Over”. Any Given Saturday, indeed. (Bye) Here we come to the first team to have no real change in its standing this week. Ah, those Colts–models of consistency. (Bye) So, apparently the Giants were jealous of all the attention that the Jets have been getting, and decided they needed to start barking too. Okay, I guess. See how much people pay attention to a team that’s not in the playoffs. (Beat SEA) We finally get to the lowest remaining playoff contestant. The Bears won, but cratered in the rankings. What happened? The Jets beating the Patriots happened. That looped away the Bears’ win over the Jets. It also looped away the Bears’ loss to the Patriots, but the amount of support given up was much more significant than getting out from under one team. On the plus side, beating the Seahawks caused a season split that broke up a four team beatloop of CHI=>DET=>TB =>SEA=>CHI, giving the Bears back a beatwin over Detroit. Well, it’s slim pickings, I guess. (Bye) As mentioned, the Saints got out from under Ravens due to a three team loop with Pittsburgh. And just at the right time, too–last week Baltimore had no teams above them, but this week there are lots. New Orleans now has no beatlosses…for now. (Bye) The four team loop the Bears broke up gave the Buccaneers back their win over the Seahawks. Hint: that’s not worth much, and it certainly doesn’t compensate from the extra downwards pressure being exerted by their loss to the Ravens this week. (Bye) Looks like the Raiders got their man–meaning, the guy they already had who was supposedly doing the real work. I hate to say such bad things about people, but you get the feeling with some sports franchises that the only way they’ll get better is if the owner dies. It’s awful to say, but that can be the case. It was the case with the Blackhawks. It might be the case with the Raiders. (Bye) I was a little surprised to hear so much support for Arian Foster as Pro Bowler/Offensive Player of the year. I dunno, he definitely had a good year, but it seemed like so much of his damage was done early in the year. Looking at his stats says otherwise, I guess. Maybe it’s just the entire stench from the Texans’ second half that I’m smelling. (Bye) I have to admit that I thought all the talk about the Jaguars taking Tebow (my favorite topic!) last year because he was a local star was silly. But looking at it now, it seems like Jacksonville might be an okay place for him. Garrard can hold down the fort for a few years, if not more, and the two QBs are kind of similar (Tebow’s a better runner, Garrard a better passer). Of course, it’s impossible to tell what the dynamic of the team would have been if Garrard had to hold off a challenge from a highly drafted rookie QB. In any case, I guess Garrard will probably give them some more good seasons for awhile. But I’d suggest drafting a possible replacement sooner rather than later. Otherwise, you run the risk of being in a situation where you try to draft a young replacement but have no credible veteran to calm things down until the kid is ready. I like to call that the “Hasselbeck Zone”. (Bye) Man, I sure talked a lot about the Jaguars, didn’t I? Meanwhile, I have almost nothing to say about the Chiefs. Maybe they should get a QB controversy; then I’d have something to yap about. 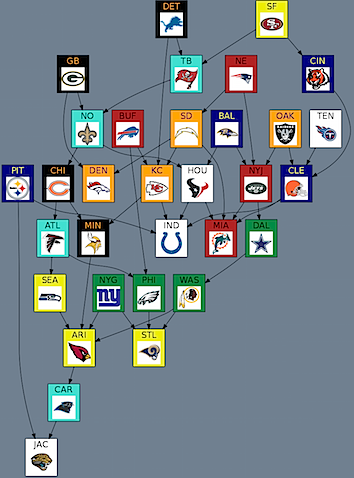 (Bye) There were two four team loops of Detroit’s broken up this week (see above), but both of the wins involved (Miami and Tampa Bay) were looped away by other teams, so no gain for the Lions. I’m curious if the fact that the Bears and Packers are in the NFC Championship makes people look more favorably on the Lions. It seems like the NFC North was a bit tougher than people predicted. (Bye) I’m a little worried now that I have become aware of who Jay Cutler’s girlfriend is. I’m just not used to having a high profile celebrity as my QB; usually, we don’t have them around long enough to care who they’re dating. So I turn to you, Cowboy fans, for advice. How do I deal with this? Should I care about Kristin Cavallari at all? Or does she just get dumped in 3 months anyway? (Bye) Lots of loops getting broken up around Miami, but they were in a lot of loops already so there’s not much change–just a beatloss to Pittsburgh added. Plus, the Heat are dropping like flies. I’d feel bad for you, but it’s currently below freezing and snowing 4+ inches. (Bye) The Vikings have apparently added Singletary as their LB coach, which is interesting. I’ll always like Singletary because of his playing career, but I’m feeling very pessimistic about his coaching career. I think you can fail as a head coach and come back, but only if you learn something; and I’m not sure that you can learn to not be a complete hardass. (Bye) I’ve been sitting here 5 minutes and I just don’t have anything to say about the Titans. What can you say about this team before it sorts itself out? I don’t know if you can predict their future until Vince Young gets traded. (Bye) The Browns apparently decided that the Rams OC was their guy. I can see where that would make sense, although it seems like it’s a pretty short resume to go on. Wouldn’t you like to see him continue that success with Bradford another year? (Lost to CHI) Actually, the “Hasselbeck Zone” is about 5 yards past Roman Harper. ZING! Been saving that joke for paragraphs! The loss to the Bears creates a season split (and finally definitely puts to death one of the great horrors of 2010 Beatpaths, SEA=>CHI) and breaks up a four team loop, which puts the Seahawks’ loss to the Bucs back in the graph. It hurts them somewhat, but not too much. (Bye) Whatever happens to Buffalo in the offseason, I just hope they go to win. The past few offseasons it seems like they’ve been acting like the Royals or Pirates, paying as little as possible to stay profitable without really concerning themselves with talent. I’d really like to see this team compete. (Bye) Meanwhile, I really don’t like the loss of Shurmur for the Rams. I’m not saying McDaniels won’t do a good job; I just don’t like a young QB having to learn a new system in both of his first two years. Be wary of Jason Campbell Syndrome, Sam Bradford. (Bye) I hope that AJ Smith proved his point with those contract holdouts, because it seems like it cost him this past season. Actually, I guess if he hadproved his point, I would probably know what it was. Not looking good, there, AJ. (Bye) So, who’s the big acquisition that Washington is going to spend lots of resources to get this year? I’m putting my money on Nnamdi Asomugha. He fits the Redskins free agent profile PERFECTLY. (Bye) I guess if I had a suggestion for the Bengals, it would be for them to try to get back to whatever they did in 2009. Because they swept the division that year, and if you’re good enough to do that in the AFC North, you should be good enough. (Bye) It’s really weird how much this team has deteriorated. In theory, there are still stars like Steve Smith and DeAngelo Williams and Jonathan Stewart…but they don’t seem to be able to overcome the rest of the roster. Good luck Ron Rivera. (Bye) I don’t know if I’ve said it before, but if I were going to pick a landing spot for Vince Young, this would be it. I think they’ve got a lot of decent talent on offense around, they just need someone who can be effective at QB. And I think Young can be an effective QB, for certain definitions of “effective”. (Bye) Of course, why wouldn’t I choose the Cardinals for Young, you ask? Well, the difference between the Cardinals and the 49ers is that the 49ers have a running game. And a really good tight end, too, but mostly the running game. (Bye) We all talked about the Tebow-Orton thing last week, so something new this week. So, John Fox, huh? I’d feel better about that if I had any idea what he was bringing to the table. By the end of that Panthers run, they didn’t seem to have a good offense or defense. How is Fox going to remake this team? Or is he just a placeholder until some other coach decides to come back to the game? Hey everyone! 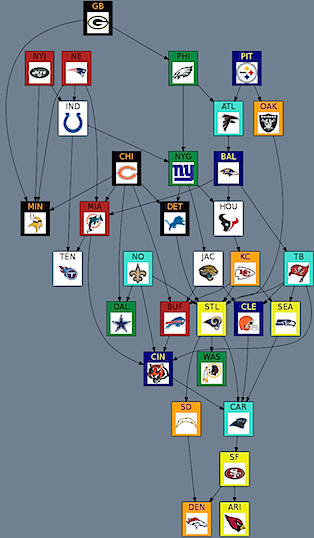 Here’s the graph for the divisional round. Crazy playoffs! The rankings were again 1-3. I love that all four conference championship teams have no beatlosses.